I don't usually do a lot in the bedroom and since it is small, there really isn't room for a tree, so a little vignette on the dresser is about all I do. This year I felt like I needed to upgrade some of my decor, so of course I went browsing through goodwill. I found a fabulous tree and a wonderful Santa. I originally found the tree, so I just added one of my reindeer and called it good. 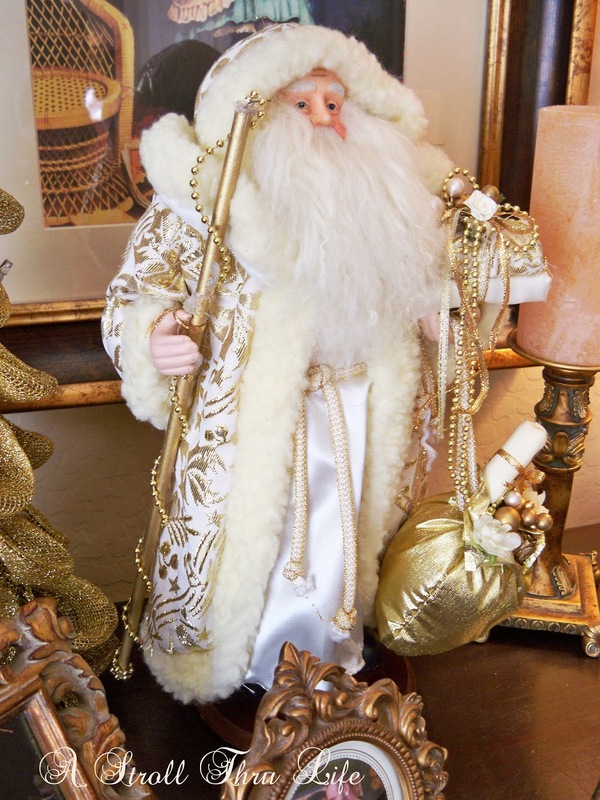 Then on another trip to goodwill, I found this gorgeous Santa. He still had his original tags on him for $34.95. He was marked $9.95 at goodwill and then it was 25% off day, so I got him for a steal. I love his stocking with all the pearls and fur, plus his gorgeous gold bag full of goodies. His robe and staff are stunning too. He looks perfect next to the metal mesh tree that I found earlier. Isn't this tree interesting. I love that it is made of metal metallic mesh and has lights on it. Now I think these two are a gorgeous upgrade and look perfect on the dresser. Are you discovering that it is time to upgrade a few of your decorations too? I love your new decorations. Those three items work perfectly together. I am amazed at how people find things at Goodwill stores, I am seriously going to have to investigate the one's near me more often. Happy Holidays! 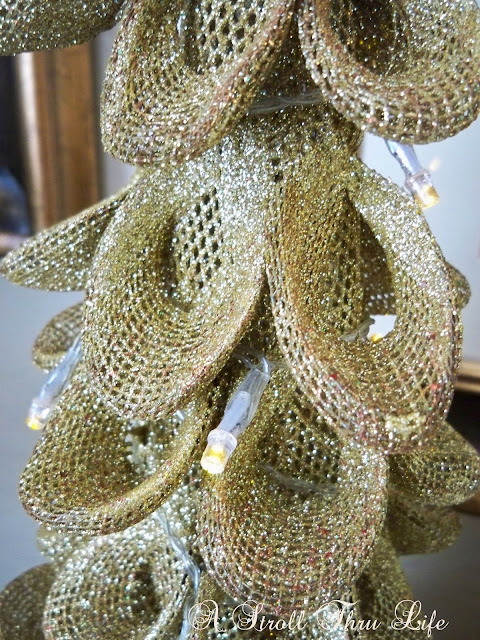 Marty, your golden Christmas decorations are perfect to add a little glitz in the bedroom. This is one space I haven't done yet for Christmas, but hopefully I will too someday! Love all the gold Marty and that Santa kinda looks like the one I have on top of my tree right now but yours is much grander, and again, perfect Christmas Vignette! Une très riche idée... Vous êtes merveilleuse et vos billets si délicats... Une grande créativité. Your room looks festive, yet so elegant. What a beautiful Santa, Marty! He goes so perfectly with the rest of your vignette. Since we got a King size bed a few months ago, I don't have room anymore for a little tree in an urn I was using in our bedroom. I like to put a few things in the bedroom but not too much and nothing too big. I can't believe the luck some of you have finding neat things at Goodwill. I go and rarely find a thing! What a pretty display for the bedroom. 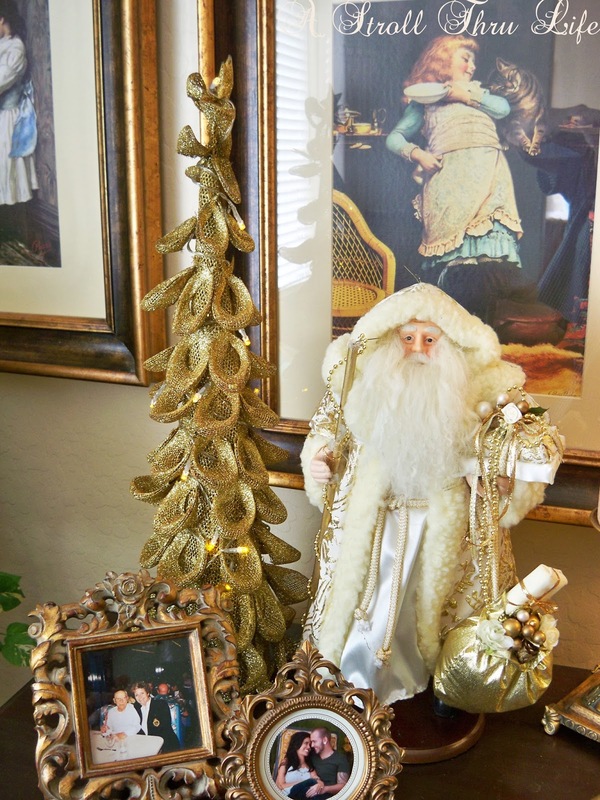 I like that gold tree and the santa. I bet it's pretty in the evening with it's soft glow. 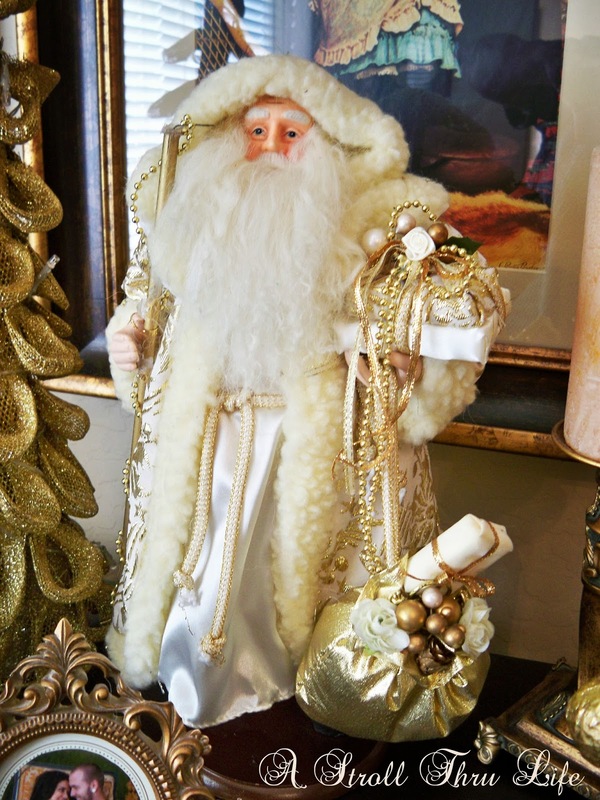 Love your pretty bedroom Christmas vignette Marty and the cream colored Santa is gorgeous! I have a red one just like it but I'm liking yours much better. Beautiful Christmas touches for your bedroom! Even better when things are found while thrifting. I've barely bought any new Christmas decor as I'm trying to simplify and pare down. Marty, you somehow manage to say upgrade and Goodwill actually make it work together. That brand new Santa is unbelievable. You must have a much nicer Goodwill than I do. I love gold at Christmas. I did gold two years ago and loved it! That reindeer is a cutie, too. 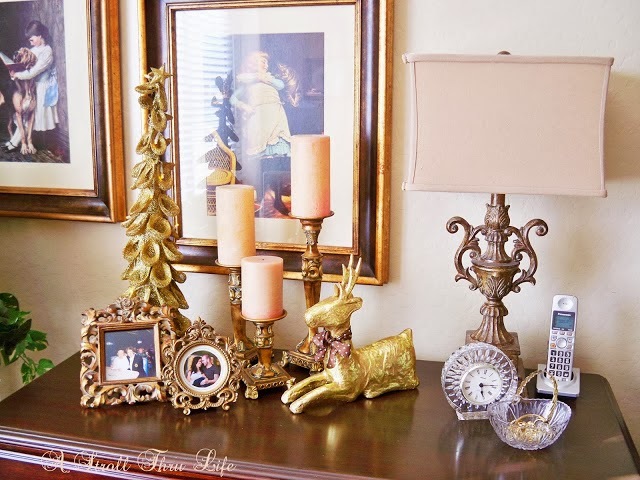 Beautiful vignette for your bedroom! You always surprise me with your Goodwill finds. Wow, Marty, I can't believe you found your handsome Santa and tree at Good Will … amazing finds that look beautiful in your bedroom! It's amazing what you can find at Goodwill! I love going there! 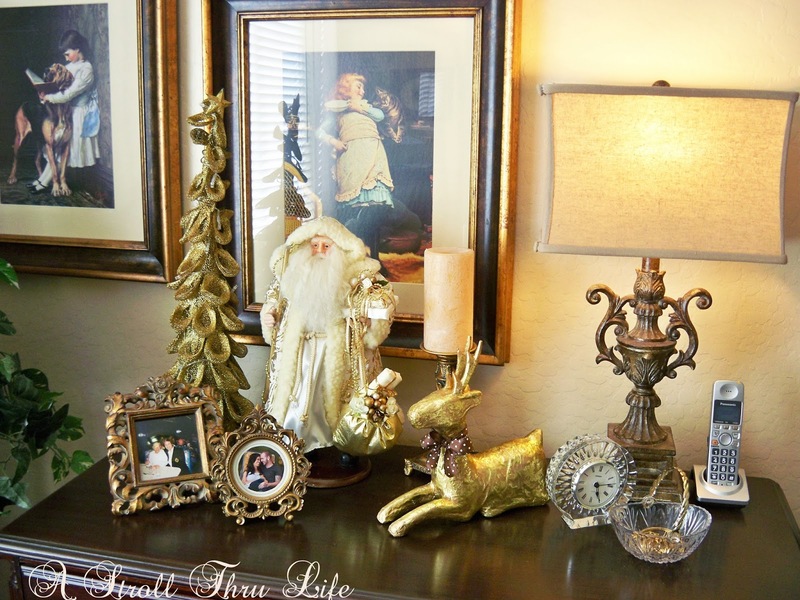 Love the gold Santa and Christmas Tree in your Master bedroom, dear friend!!! You have the most inspiring vignettes!!! The bedroom vignette is so pretty, Marty. You cannot beat the thrift shops for those fun and exciting finds. Yours are great.